I recently read Illusion, the newest book by bestselling author Frank Peretti. 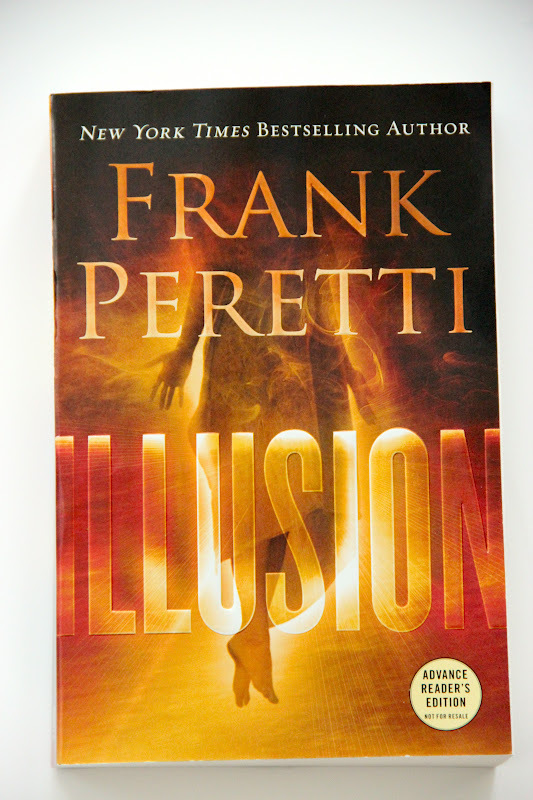 Frank Peretti has written a bunch of books but this is the first that I've actually read by him. If you're into books that are a little outside the scope of reality (and these days, who isn't? i.e. Twilight, Harry Potter, Hunger Games), then you would probably enjoy this book. The book is a love story of couple with a popular magic act. At the very beginning of the book, the wife is killed in a car accident, but she wakes up as her 19 year-old self living in the present. She realizes she is able to travel through time and space, and ends up in the same town as her grieving husband. The book details their interactions, at first neither realizing who the other is. I don't want to give any spoilers, but the book is pretty intriguing and keeps you guessing! The publisher who provided me with the book to review also gave me another copy to giveaway. So, leave a comment on this post to be entered to win a copy of Illusion! The winner will be randomly selected and announced April 9. U.S. mailing addresses only, please. I can dig that story. count me in! You know I am always up for a good new read! sounds awesome! Thanks for the giveaway and have a wonderful weekend! I already have a list of books to be read this summer when I have bit more time, maybe this will be one of them! Love you! Sounds good! If you liked it I'm sure I would! :) Miss you, girl! I am looking forward to reading books by the pool this summer! It will be a wonderful break from nursing school and wedding planning! Hope you two are doing well in S.C. Your blogs are just too cute :) I really enjoy reading them! I love a good novel! I have been hooked on Frank Peretti's books ever since reading "This Presence Darkness" and "Piercing the Darkness" year ago. I know that I would love to read his latest book.